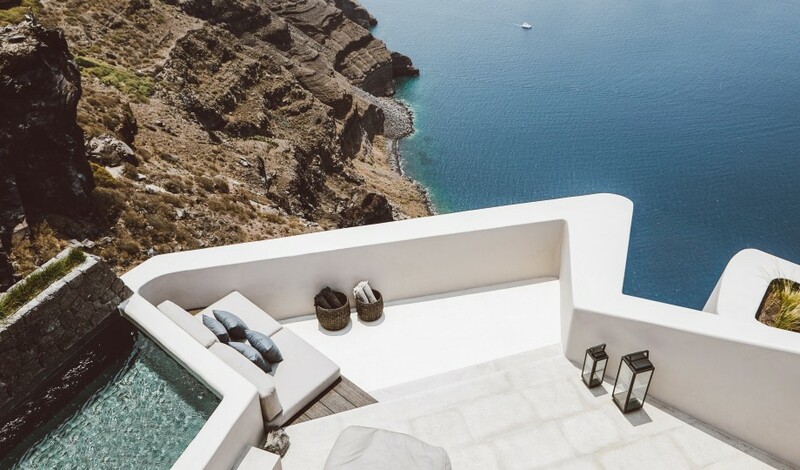 —Carved into the face of a cliff on one of the world’s most beautiful islands, Vora offers views, privacy, and luxury that are worthy of the gods. 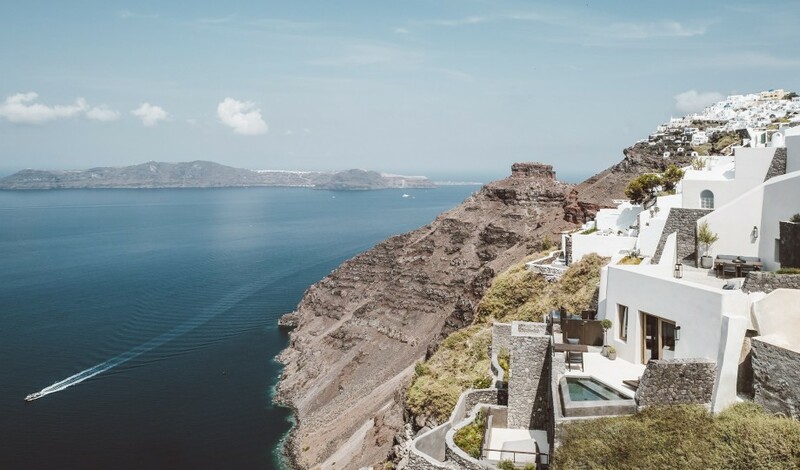 The Greek island of Santorini is famous for its sun-bleached houses, blue-domed churches, narrow streets, and breathtaking views over the expanse of the Aegean Sea. But now that list of superlatives includes a new statement of both luxury and tradition, one that literally hangs from the cliffs of the island’s famous caldera. 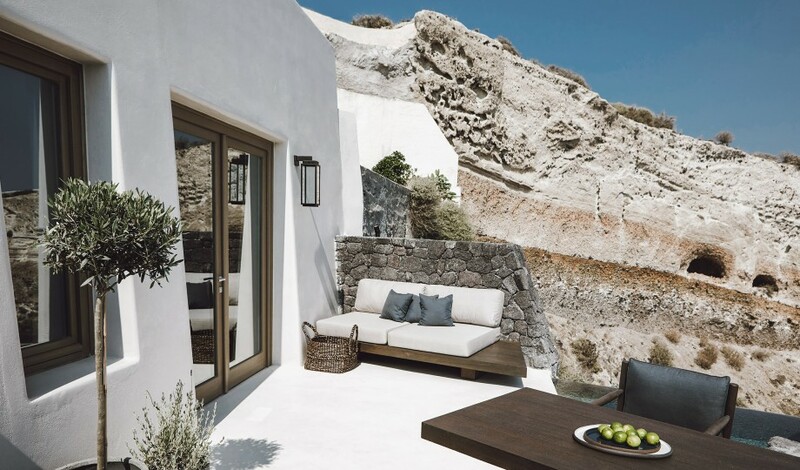 Overlooking the volcano with stunning views of the island’s celebrated sunsets, Vora is a handcrafted new construction of private villas carved into caves and cliffs and suspended high above the sea. 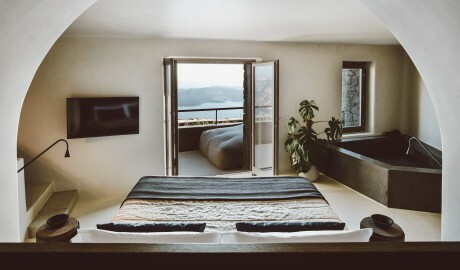 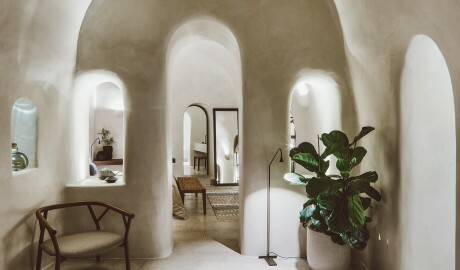 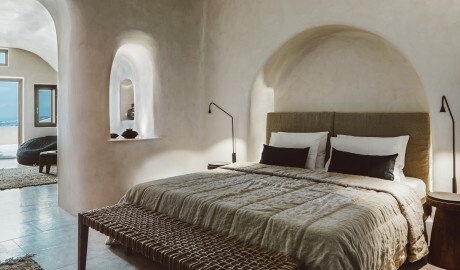 Here, in one of the most beautiful spots on Earth, and on one of the most difficult for building—construction machinery could not reach the hotel site, so everything was hand-built over a four-year period—one finds sublimely private villa accommodations inspired by the volcanic environment and boasting minimalistic Cycladic design, custom-made furniture, and a soothing palette of beiges and grays that are augmented by dark brown wood. 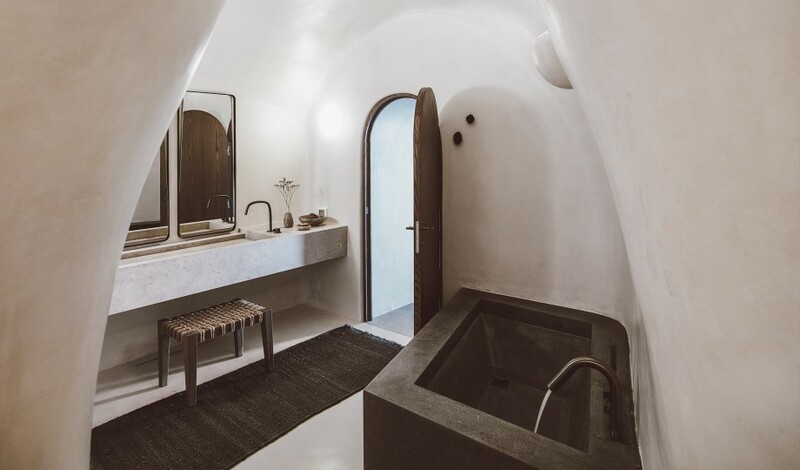 A private plunge pool with each villa completes a picture that seems as impossible to create as it is perfect to experience. The three villas span up to 145 square meters and all feature a king-size bed, a bathtub and a shower, a full kitchen, and a dining area. 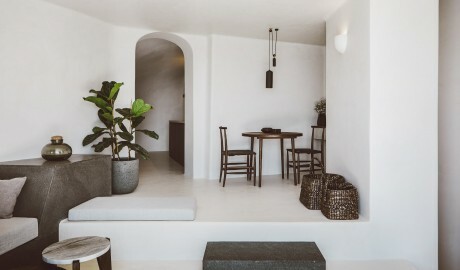 The Villa Alpha and the Villa Ro both cover two floors, with the former boasting two verandas and a black marble bathtub, while the Villa Omikron is a one-level cave villa—a fine example of the traditional architecture of the island. 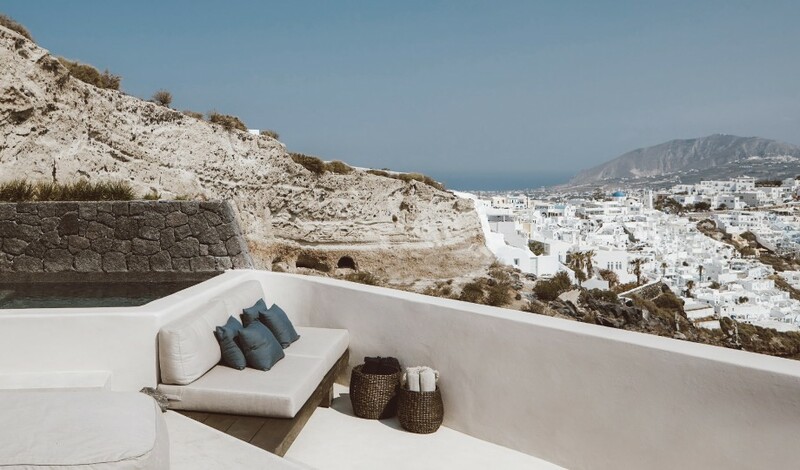 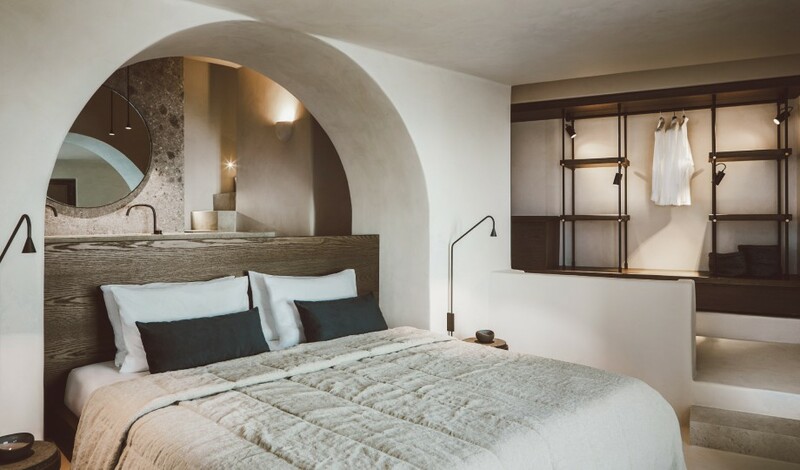 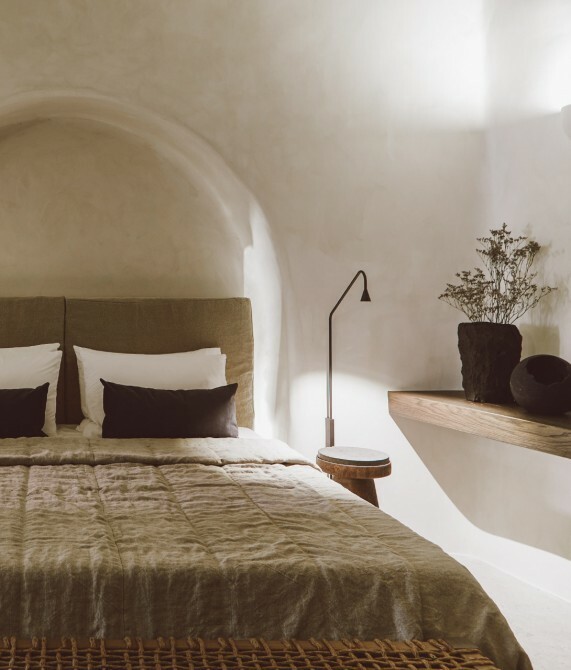 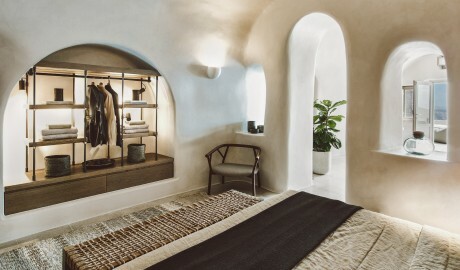 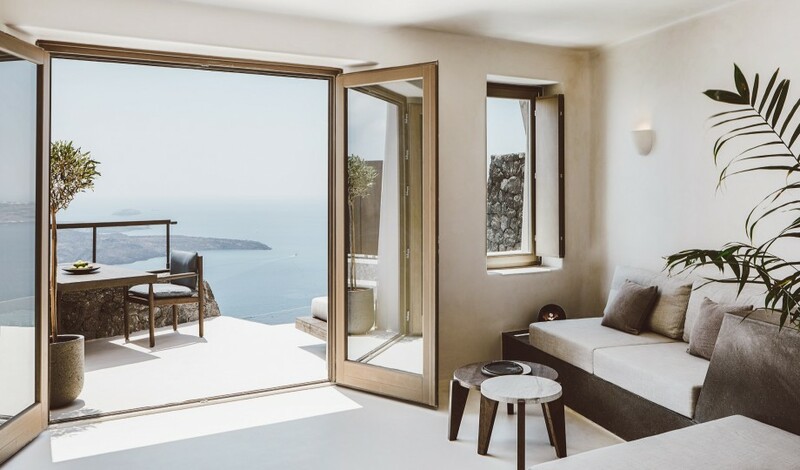 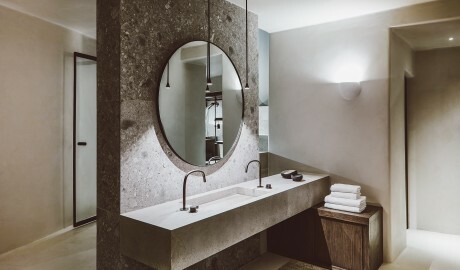 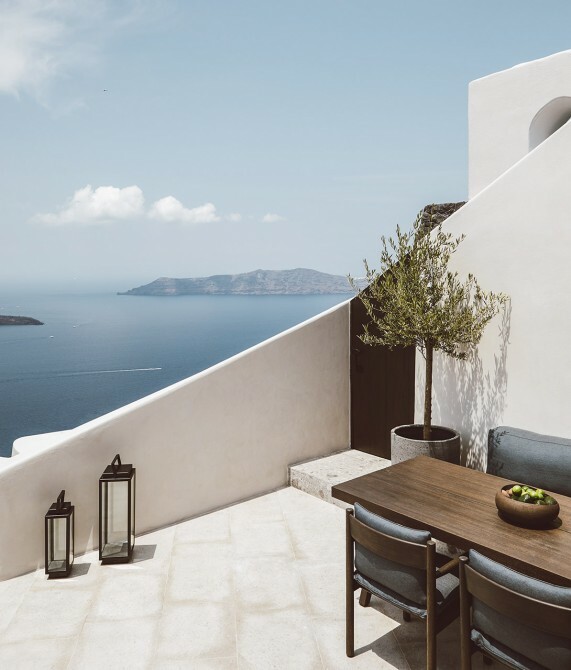 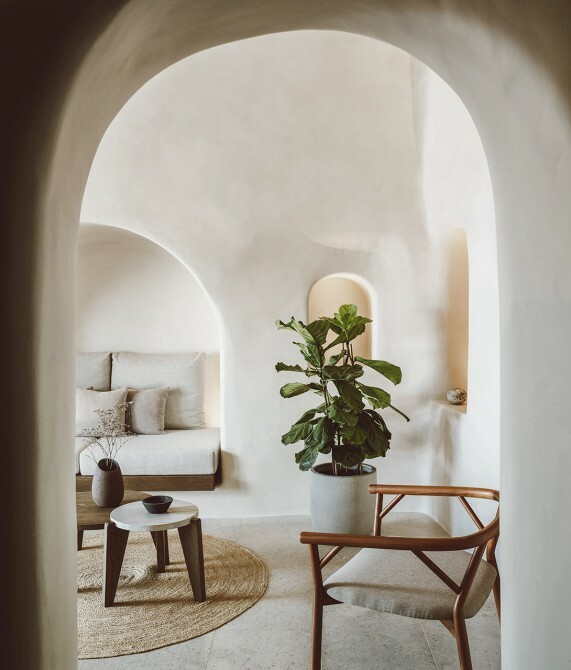 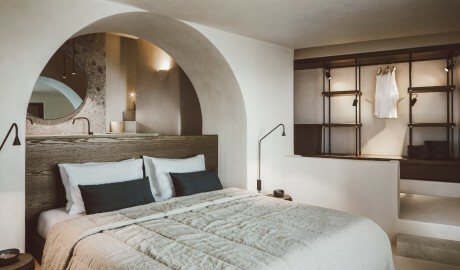 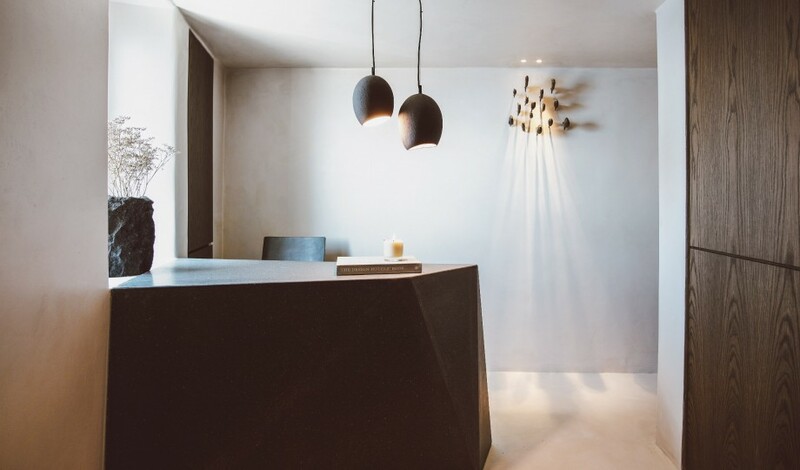 As a beautiful contrast to the hotel’s rough-and-tumble cliffside setting, K Studio crafted inviting and sublimely soothing interiors defined by minimal Cycladic design, custom-made furniture, and luxury design elements. The heavenly setting of Vora required heavenly inspiration, initially for Kapsimalis Architects, and then from the design and architecture firm K-Studio who took over the project. 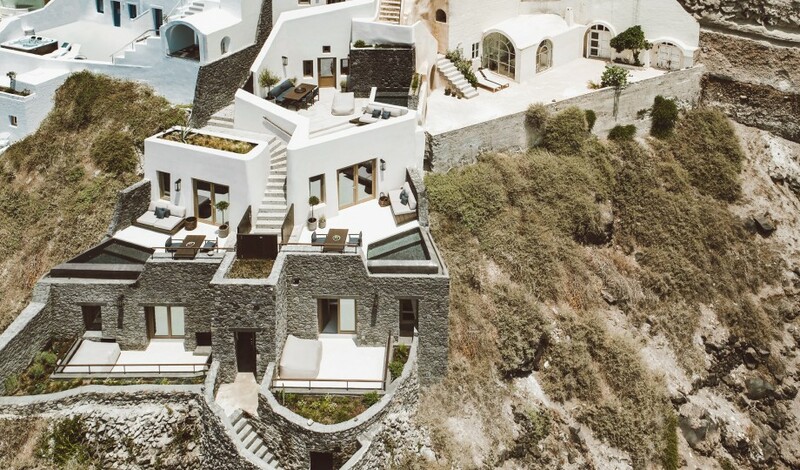 And it came in the form of local press-cement construction techniques that allowed for cliffside stacking of the luxury, cave-like structures. Santorini native Yannis Bellonias imbibed the island’s traditions from his early childhood, spending his youth there and returning soon after graduating from university in the U.S. But growing up also means evolving. 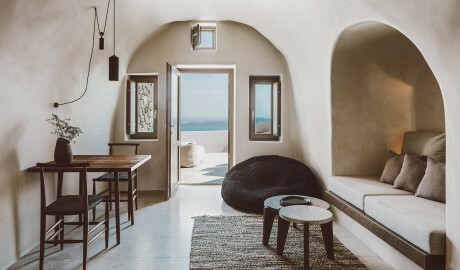 Bellonias brought back with him a set of ideas that involved preserving the traditions of the island, while advancing its allure on the international stage with a contemporary spirit. “I think that I’ve managed to show to locals that there is also another way to do business, other than the touristic one,” he says with a note of pride. 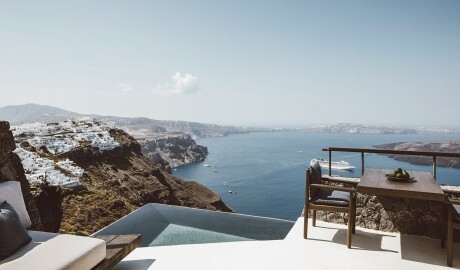 Set in the north of Santorini just two kilometers from the island’s capital of Fira, the picturesque village of Imerovigli perfectly lives up to the meaning of its names—“view spot”—as it offers a clear and stunning view of the caldera.